I think Brussels Sprouts have come a long way. They used to be the dreaded vegetable, the one nobody liked. But more and more, I’m finding people who love them as much as I do, including my 13 year old daughter and a lot of her friends (surprising, but true). I think, people have finally just started preparing them in ways that bring out all their delicious flavors, instead of just boiling them all away. 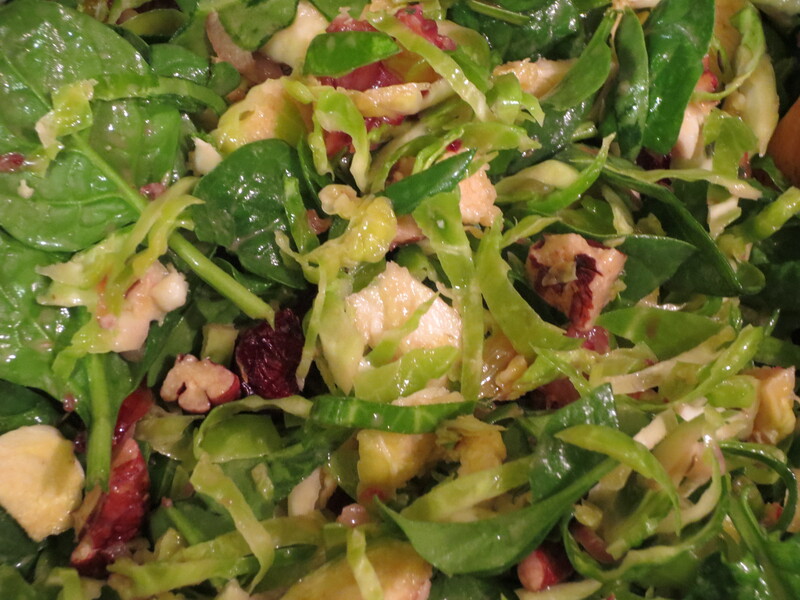 But for those of you out there who still can’t get past the strong and somewhat bitter flavor of the roasted sprout, have I got a surprise for you…the raw Brussels sprout. The raw version is completely different than the cooked, they are surprisingly mild in flavor, delicious in a salad and what’s even better it’s a salad that keeps well for days in the fridge, leftovers make a perfectly quick and easy healthy lunch or snack. Whether you’re a fan of the roasted sprout or not, I encourage you to give the salad a try and IF you’re new to the world of Brussels sprouts, do not hesitate to roast up a few and enjoy. Wash Brussels Sprouts, trim off stem ends and remove the outer leaves. Cut smaller sprouts in half and larger ones in quarters. 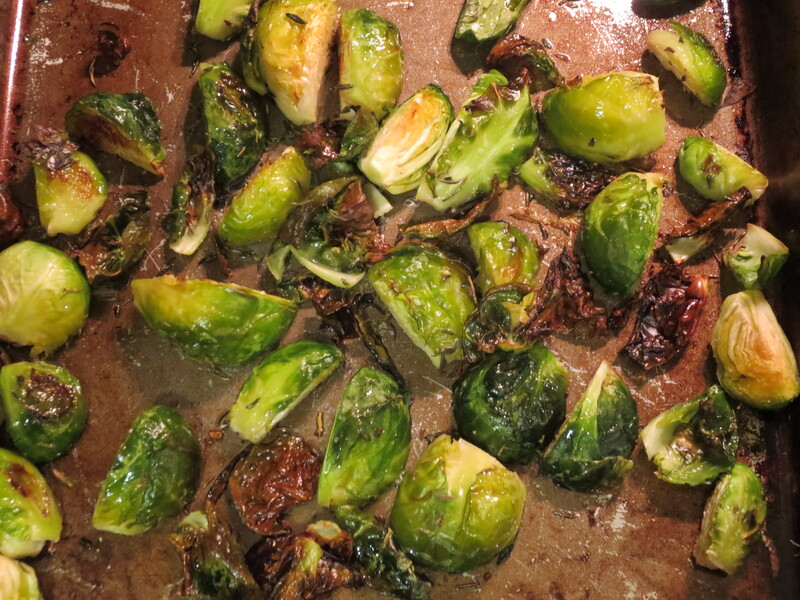 Note, I know a lot of people roast their Brussels Sprouts whole, but I prefer to halve or quarter them, allowing more of them to brown and crisp, which is what makes them taste so darn good. Toss Sprouts onto a rimmed baking pan, drizzle with olive oil, sprinkle salt and thyme and toss so the sprouts are evenly covered with the oil and seasonings. Cook in the 375 F oven for about 15 – 20 minutes. 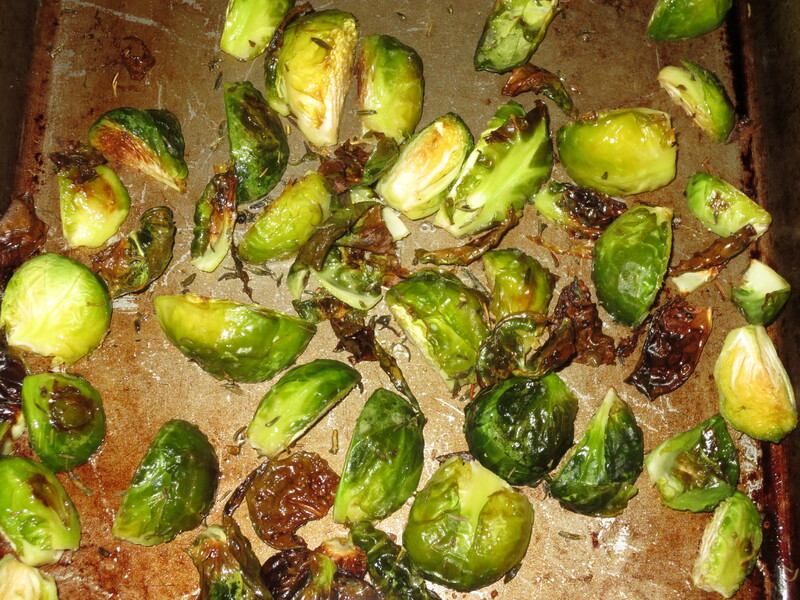 Turn the sprouts around and return to the oven for another 10 – 15 minutes, until the outer leaves turn brown and crispy. Remove from the oven and serve. Enjoy! Recipe Notes: This is one of those recipes where it’s easy to adjust the quantity of ingredients to your needs and tastes. A 10 ounce container of Brussels Sprouts will serve about 2 – 3. I like to make my salad dressings first in the bottom of the serving bowl, that way nothing gets left behind in the transfer and you have one less bowl to wash (always a plus!). Combine all the dressing ingredients in a large bowl. 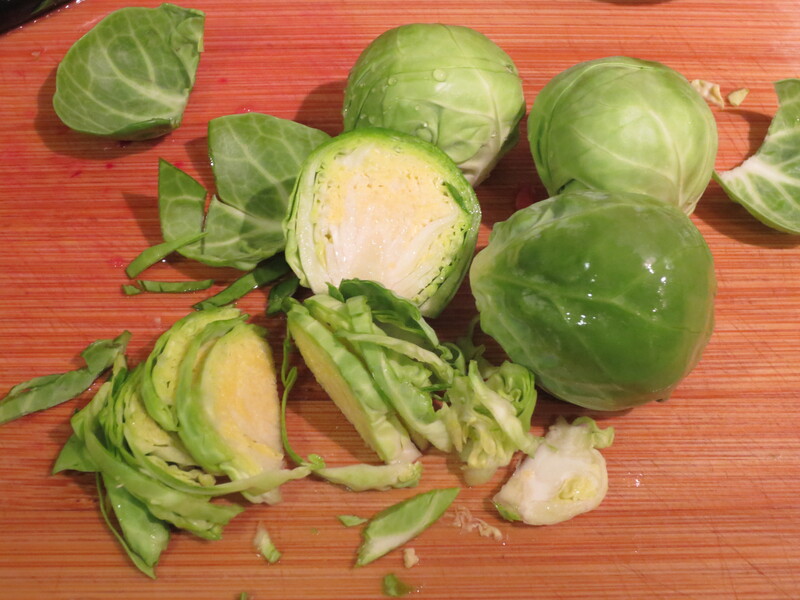 Wash the Brussels Sprouts and trim off the stem ends, remove the outer leaves. Finely slice and break apart, you can leave a few leaves whole if you like. Add the shredded Sprouts to the bowl with the dressing and toss. Next add in the Arugula or Baby Spinach, if your leaves are large you can slice them a bit, leaving smaller leaves whole. Peel the Oranges and separate the segments. Depending upon the size of each segment, cut in half or thirds. Add the Orange pieces to the bowl, along with the Cranberries and Pecans. Toss everything to combine and serve. Enjoy! Recipe Notes: a little crumbled Goat Cheese is a nice addition, but definitely not necessary. 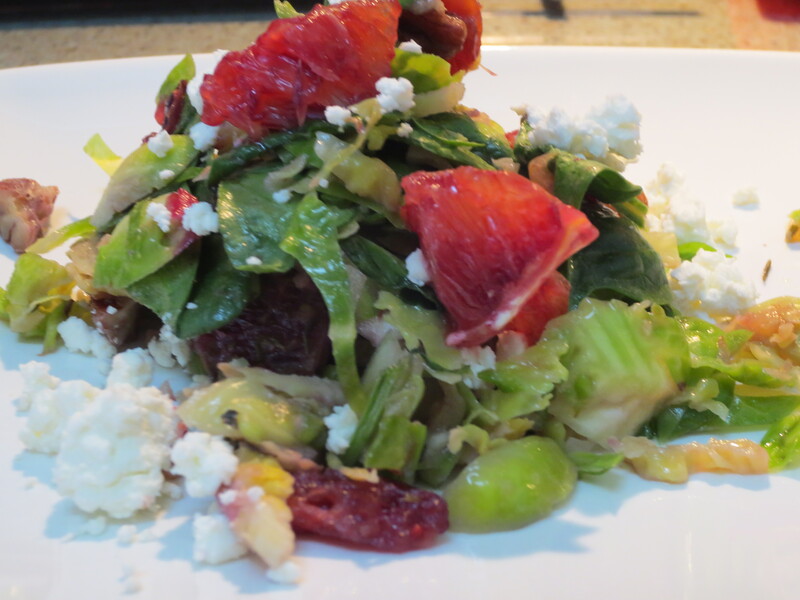 Leftovers of this salad keep great for a few days in the fridge.